It's Hallowe'en! That time of year when we play snakes 'n' ladders with death, peek-a-boo with darkness and rock, paper, Armageddon with evil. Fun! Behold Death. He's stripped to the waist to show off his brand new array of internal organs. He looks great! At least 3 or 4,000 years younger! The surgeon says he can choose some skin in a few weeks, maybe even an eyeball! Here be Darkness. Her flower arranging has really come on leaps and bounds this year. She's taken a very important step and decided not to paint all the flowers entirely black. We now have one crimson petal peeking out from the shadows. She says it's a revelation! Yonder is Evil. He's dressed up in a long, white robe with a little cardboard halo fixed onto his head by a piece of wire. He does that every year but it's hilarious every time! But some creatures don't need to dress up in a long, white robe to be scary. They don't need clothes at all. They're entirely NAKED! All the time! Let's go see! 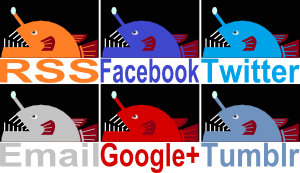 Who ever heard of a Hermit Crab in orange and red tights? It must be quite complicated to put them on too, what with all those legs. The Hallowe'en Hermit hails from Hawai'i, where it can be found crawling along the sandy seabed near coral reefs. They're not fussy eaters, and will gladly munch on near enough anything they can get their little pincers on including algae and living or dead animals. They're a lot more fussy about their housing. 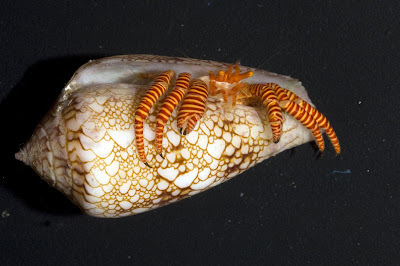 Like other Hermit Crabs they have a soft, defenceless abdomen which must be protected with a snail shell. They prefer the shells of cone snails, which come in a wide variety of size and colour. Despite the snazzy get-up I don't think they're too concerned with living in a colour coordinated shell but the size is important. Hallowe'en Hermit Crabs reach up to 5 cm (2 in) long, which is actually quite big for a Hermit Crab. Oh jeez. Vampire has gotten on the piano and is regaling us with tunes about loneliness and lost love. It really isn't party material, you know? There's been a murder! Either that or someone has discovered why you should never ask someone with wings and no fingers to carve pumpkins for you. 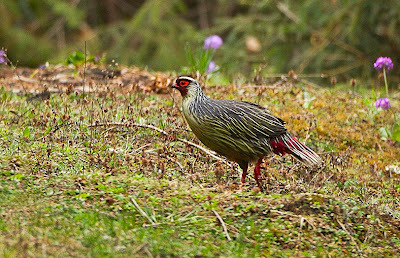 The Blood Pheasant comes from the eastern part of the Himalayas, in India, Nepal and China. At around 45 cm (18 in) long they're quite small as pheasants go, but that doesn't stop them from catching the eye. The males appear to have recently conducted a frenzied and barbaric attack on some poor victim. They have what looks like blood all over their face and neck, streaking their breast, soaking their tail and coating their legs. It's like they've been paddling around in the stuff! Tap dancing and splish-splashing all over the place. Sick! 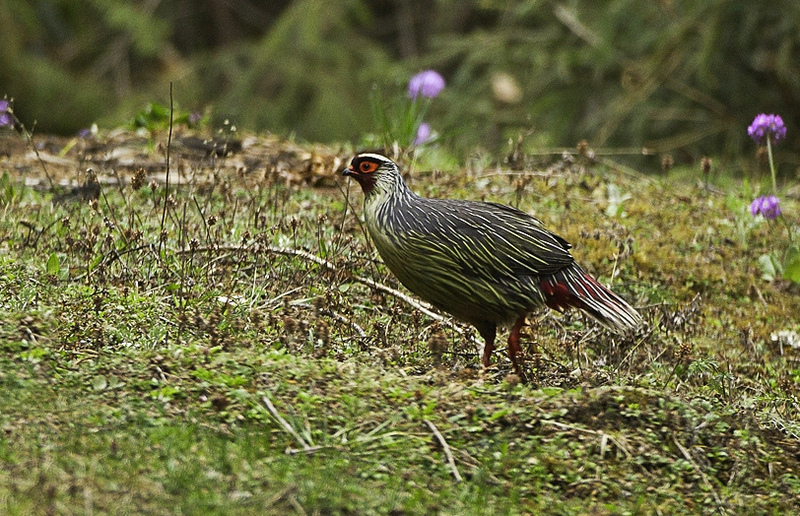 There are about a dozen different subspecies of Blood Pheasant, each one distinguished primarily by the pattern and intensity of blood splatter. It's The Birds meets CSI. As is usual with birds, only the male is covered in blood. The females are just brown. Which, as we all know, means she is the true mastermind behind his criminal activity. Looks like Werewolf got his legs waxed. It looks... odd. Not long ago we had a look at a delightful little Coffinfish that looked like a big strawberry. This time we get to see more of how they might of got their name... this fish is almost a cube! Standing there on those leg-like fins it looks like Mr. Grumpy's long lost cousin. VERY long lost. 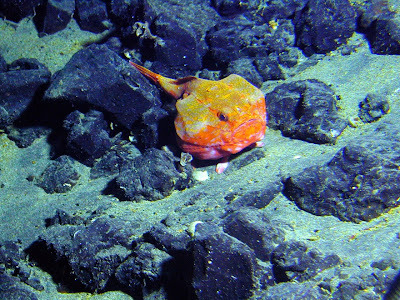 This is a deep sea anglerfish who waves a bioluminescent lure to attract prey. 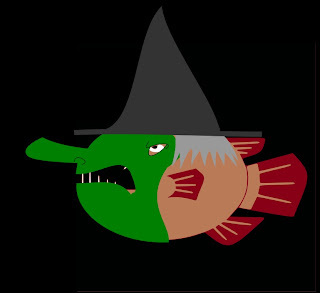 When they're within reach, the Coffinfish gobbles them up. And that still won't put a smile on her face. Whoops! I thought Mummy had lost weight but it turns out it was Daredevil Skeleton. He had a bit of an accident and broke every bone in his body. This is just crazy! It looks like a vampire got caught out in the sunlight while wearing a shirt with extremely extravagant cuffs. It isn't though. It's the Devil. So red is his natural colour rather than the result of severe sunburn. Also it's a flower. 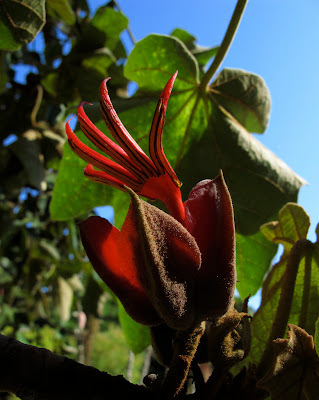 The tree it comes from is native to Guatemala and Southern Mexico, and it reaches somewhere between 10 and 28 metres (35–90 feet) tall. The five, clawed fingers are actually the stamens and the strange cuff are the petals. I remember a wasp once flew right into my hand and I guess now I know why! 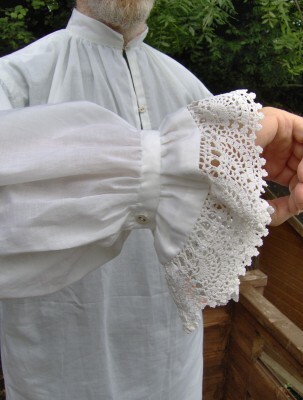 I wasn't wearing puffy cuffs like that, though. 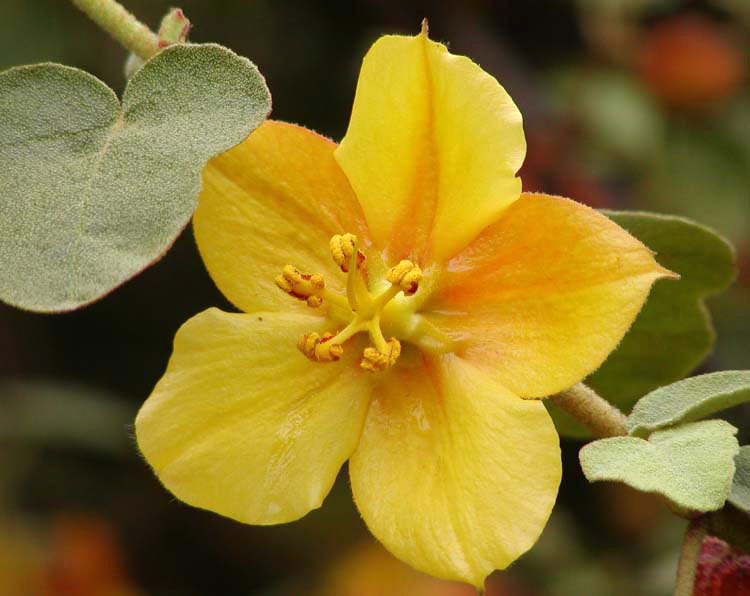 The Devil's Hand Tree is closely related to a rather ordinary flower called the Flannelbush. They have even been interbred, creating a beautiful, unnatural freak called Chiranthofremontia lenzii. A priest showed up! Things got a little awkward and the family of Poltergeists were clearly agitated. It's OK though, turns out he's possessed by a charming, rather avuncular Evil Spirit. He's a delight! Gosh. It's like a mushroom that wants you to "KILL IT WITH FIRE", like that pig thing that wants to be eaten. 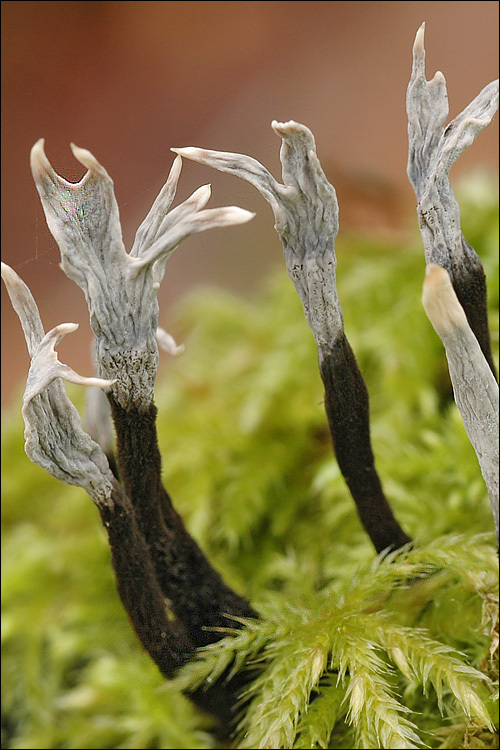 These peculiar mushrooms sprout from decaying hardwood in North America and Europe. They reach up to 8 cm (3 in) tall and are actually completely black. However, when they first emerge they are covered in a white powder of spores that are all clones of the parent fungus. Once all those spores have blown away in the wind you can see lots of little pimples with holes on the charcoal black surface. These now release yet more spores, this time ones that were created after mating with another Candlestick Fungus underground. Like many other mushrooms these candles are full of all sorts of chemicals, some of which are toxic, while others are useful against tumours. So it's probably best to "INVESTIGATE IT WITH CHEMISTRY". Just been having a very interesting chat with a visiting Reptilian. But I've already said too much. Abomination! 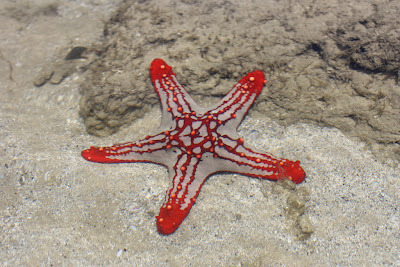 This starfish is so unremittingly evil it even has a pentagram in the middle! OK, I guess it's more of a little star in a pentagon, but that just shows how little we truly know. It's also covered in tubercles that look like throbbing boils that at any moment may *BURST* and *ooooooozzze* all over the floor. I guess diabolicalism is bad for the complexion. The Red-knobbed Starfish lives in the shallow end of the Indian Ocean and can reach up to 30 cm (1 ft) across. Evil is usually pretty glamorous, especially when a nice suit covers all the pestilential pustules, so this starfish is popular among aquarium keepers. Here, they'll be satisfied with algae when they're tiny but they grow increasingly demonic with age until they start feasting on sponges, corals, clams, other starfish and the lamentations of their women. Bigfoot? What's Bigfoot doing here? And where's he gonna put his massive foot? Ah, well. At least it's not as bad as that time the Loch Ness Monster came round and had the basement flooded and cut a big hole in the floor for her head to pass through. This has got to be one of the most beautifully evil looking sticks ever! And it doesn't even have a massive, rusty blade on the top. The body looks so soft and velvety, I feel... seduced! The Devil wears suede. Then there's those tiny wings. Usually they're covered by a little spider-web design but when unfurled, we see bright red and run away in fear. I think that's what we're meant to do, anyway. And if that doesn't work they'll squirt us with a stinking fluid from glands behind the head. It's not terribly poisonous, but it's always best to control what stinking fluids you allow yourself to get drenched in. Oh, and all the while they'll be staring at you with their beady, yellow eyes and fabulous pseudopupils. The pseudopupil is the part of the compound eye that is head-on with the observer, it absorbs light while the surrounding parts reflect it. It means that those eyes will follow you around wherever you go. So never fear! Black Beauty is watching. Watching. Ever and forever watching. Oh no! The zombies have set up a choir! With all that nasty rot-juice in their throats they sound worse than drunken Europeans. And that's REAL bad. Well, I guess this one isn't natural at all but it's definitely trying. Heck Cattle are the result of attempts in the 1920s and 30s to resurrect the ancient and extinct aurochs that once strode the land from Britain to Korea, and which went extinct in 1627 when the last of her kind died in Jaktorów Forest, Poland. I'm afraid there wasn't much use of crazy labs, electricity and cackles of "it's alive! ", but there may have been a mad scientist or two so it's not all bad. While the actual aurochs is extinct, lots and lots of modern cattle were bred from them. Breeding programmes were conducted by two German brothers called Lutz and Heinz Heck, who planned on using the more primitive cattle breeds to get something that looked more like their ancestor. The end result was the Heck Cattle. In a way, it looks more like an aurochs than most, but there are still significant differences. For one, at about 1.4 metres (4 foot 5 inches) tall Heck are a good 30 cm (foot) too short. 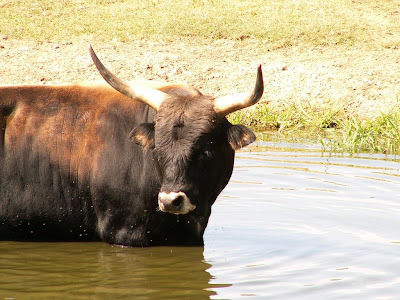 They also have the long, rather tubby body common among cattle these days but quite unlike the athletic, muscular aurochs. Looking at skeletons you can see the shoulder spines that served as attachments for the aurochs' abundant muscle, which is something that the Heck completely lacks. All in all the Sons of Heck have come in for a lot criticism over both methodology and even the very idea of breeding back an extinct animal. Such concerns haven't stopped continuing efforts to bring back to life the giant, powerful and aggressive beast. Even if they won't be called Heck, it'll still be Heck to deal with them. Awesome article as always! And just the best mood for the season. 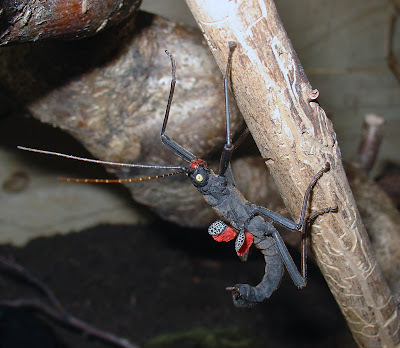 The Black Stick insect is also seriously creepy (I'm now imagining goth kids who're allergic to mammal hair buying those guys now), especially its big, yellow-eyed stare. Thanks! The Black Beauty Stick Insect is definitely an interesting alternative to a bald cat! The starfish is the best, looks like an abomination from hell - but a beautifully detailed one! It does! It has all the bits and bobs you could want from an abomination! It's amazing/terrifying.